The shirt came from her aunt Gail the Christmas before this one - and it is one of the few items I can stretch the neck on wide enough to get Esme to cooperate with it. I'll try to make her some of the blouses out of this pattern or another later - because she will outgrow it. The only pattern I could find quickly was Simplicity 3603 in size 5 (pictured). I am at the point where I believe Simplicity patterns are sized just a tad bit bigger than McCalls... the 8001 size 5 was a very good fit, this is a bit big even witha shirt underneath it. The split square necked front was a bit of a challenge, as well as the skirt was actually VERY full... I tend to pleat instead of gather, just because. I'd never get anything done if I had to fuss with gathers instead of neat pleats. Esme doesn't seem to mind, so I keep on. buttonholes to come next, as I usually do those by hand. Esme requested pink buttons. I'll probably put a few down the front, as well? And the brown rick rack would look really nice if I could get my hands on some. The white rick rack... I'm not sure what the point would be? Mama and Daddy feel that way most days, too! I made this a few days ago, mentioned it but did not get a chance to take any pictures. She wore it to town today. It is a McCalls 8001 alteration - with the two pleats in the front instead of one, and a dropped skirt front as well. It is the last bit of the blue dobby rabbit fabric from Japan bought several years ago. It was previously featured as two pairs of pants, so it has done well for two yards! She put her socks and shoes on herself. We had to take a package to the 'mailman' for Grandma, and Esme enjoyed the idea of helping with that, even though she was more interested in reading her bike book when we got there. The train set pictured is a clearance item Daddy found for her and she nearly lost quite a bit of hair to it yesterday - we had to work it out! She still did lose a little hair, but it is very hard to tell, as Daddy did a good job rescuing what he could from the track mechanism before finally cutting a small lock off with it. Hopefully she will be more careful with it now. 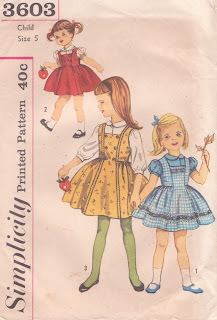 Today I am inspired by the Betsy McCall paper doll archives I found on the internet. I can't believe I hadn't seen them in all this time! Several of the dresses shown for the paper dolls have the corresponding McCalls pattern number the dress can be made from. 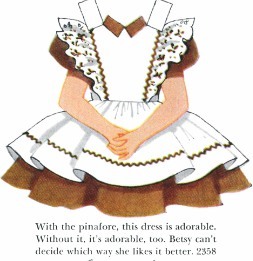 I saw one brown dress with a white pinafore (January 1960) that I really liked. 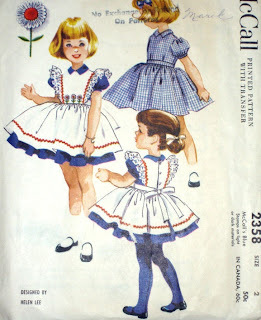 I want to replicate the look but with a brown and white gingham check pinafore. I bought some fabric but could not find any brown rick rack at the store - they had a place for it, but something else was there. :( I'll poke around and see what is in my collection, maybe I have some hiding - I know there is red and blue... 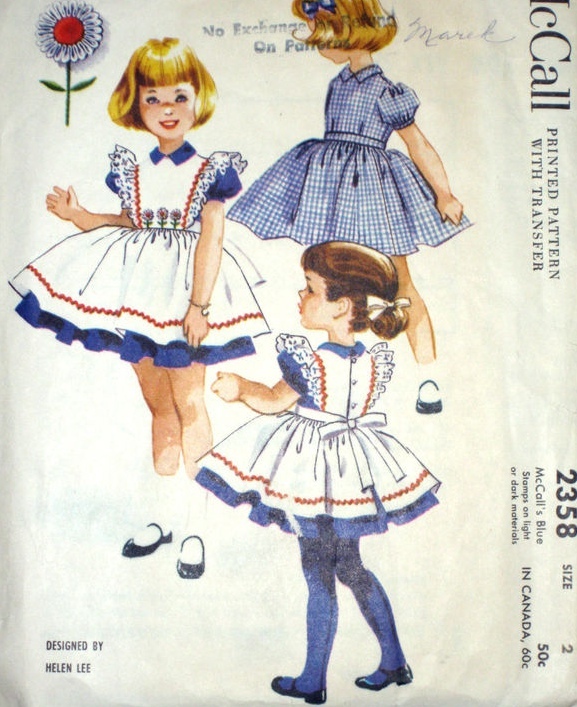 I'd like the pinafore to go over a blue dress or a brown dress. Esme has been painting a lot lately and both of her new short sleeved dresses have bodice and skirt frontispieces FULL of paint splatters.... that don't wash out! Well, that is the good thing of being a seamstress... clothes are not irreplaceable, it just takes a little time set aside to make or remake them. And paint splatters do not make them unwearable... just maybe not the best attire for town trips et al. I've passed up the chance to buy this one a couple of times... I wouldn't again! I also know I have another pattern (or two) that are similar enough to work with... going to go sort through them now and find one about a size 5. Side note: Mark got me some peppermint coffee which is VERY good. :) I really love peppermint coffee and am sad it is only available during the 'holiday' season. I've ordered a copy of this pattern to come in the mail. I don't see Esme wearing the armholes like that - but I could be wrong. And, it doesn't mean I can't alter it into something she would wear. I am very interested in the assemblage of the hood - and the general idea itself. I might be able to expand it larger to make one for myself... which I probably would wear as pictured. Planning out some 'curriculum' that will last her for years to come, whether or not we do the homeschooling track. Seeing New Things (1955 one of a large collection called "singer science series") very nice subjects covered - I'm sold and want the others! Grandma got for Christmas :) thank you! pattern blocks and worksheets for them. I think they want a book on this, but I am using letter tiles and computer printouts and hooking it into reading practice right now.... and the dry erase board Grandma got her she is practicing more letters. Books about jobs - farmer/doctor/nurse/mechanic/cook etc etc..
bird identification book for kids - find a good one? She also got a cow like these animals in her 'sock I hung on car bed!' Christmas Stocking. The red and white and blue striped socks were her other stocking item and she was happy with those, too. Grandpa Harvey from Iowa called and she talked to him and Grandma Gale about what she got in her stocking and how she was going to the white house to see Grandma (Irene) and Grandpa (Henry) soon and bring them presents! We are glad Grandpa is home and everyone could be together. I hope Grandma and him eat a lot of good food and rest up! Esme really enjoyed these blocks, too. Daddy spoiled me with coffee and yarn and candy, knitting needles and DaVinci model kits. He says he gets to help me with the kits, they are for both of us ;) He wrapped the yarn in old coffee cans which made it look like he bought me five cans of coffee - what a good joke he almost let me believe it! I bought him a shirt and socks and candy. Oh boy my cube!, thank you Santa! Thank you Grandma and Grandpa! It has been a great day and we are trying to get some rest here at home - hope Grandma and Grandpa do, too! Mark is downstairs preparing a long slow roasted porkchop for his dinner tonight. Esme is playing with her Silly Putty and Optimus Prime transformer... and still introducing all the new toys to each other. She has had a round of painting with her new watercolors and then begged to watch Transformers with her new toy. Loula is the last of Nova's puppies... out of eleven puppies and two days of trying to give them ALL away, we were left with this one. Unless someone really needs one, we might end up keeping her. Esme says 'It is my Lou-ah'. Hmmmmm.... And anyhow, don't they just look like two puppies sleeping there? I'm working my way through a robot kit from Tamiya we bought about a year ago... I think I'm halfway. Lots of parents have to do assembly on Christmas Eve. ;) hehe.. no all of Esme's presents are already assembled and mostly wrapped. All we have to do is hang the sock in the middle of the night and go to Grandpa's with the full bucket of presents tomorrow afternoon. I'm back from work and ready to get everything in order for the day! We have one puppy left. Decisions, decisions! 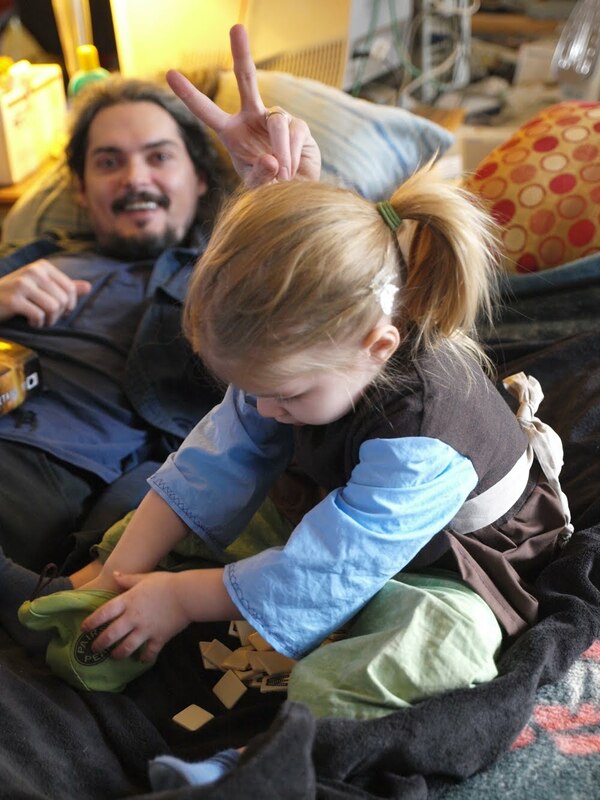 Here is Esme demanding pictures while sitting watching cartoons. I caught pictures of her breaking up laughing with Daddy - and then he had me pose for one, too. Her eyes are still so blue! I have wrapping to do - have to find some time to do it 'unpestered'. Maybe when Esme is painting later. We went out to the town today with eleven puppies and came back with four. That is a pretty good day's work, even though it was cold and windy. Esme was not on her best behavior - I think she was secretly upset that her puppies were going away but was also understanding that they were Christmas Presents.... little ones do not always do well with mixed feelings. We came home and after a bath the blonde monster seemed to disappear and there was an Esme back in her place. One of the puppies that is left is the half-deaf one Esme has been attached to. He was on our list as a potential keeper. He is trying his hardest to earn that. Very tired now, and not sure what I want to do for the rest of the night. I have Esme's sweater to work on - but the old one is lost at the moment. It might be at Grandma's house. I have a little laundry to do, some dishes, and some leftovers to use up. I work an 8-5 tomorrow and then have Christmas Day off. //wardrobe sewing notes// Looking through my patterns a few minutes ago, seeing all of the different ones I have collected that are 'current' size (5). I have nearly achieved 'stability' in her wardrobe again - three long sleeved size 5 and two short sleeved size 5. Add a new yarn sweater on to that for warmth and several coats for 'outside.' She also has at least three pairs of pants that are the right length... lots more slightly highwater. Overall, she is doing quite well and not lacking much. Mark couldn't think of anything she was lacking at the moment... and she has been better about not getting her clothes dirty/wet etc lately so we don't have as many 'quick changes' during the day as was once usual. Before I know it we will be making sundresses and shorts again ;) huh? I brought home some shiny foil garland from work last night and put it up above the door this morning. Esme told me 'Mama, you found Christmas!' and went to tell the puppies how today was Christmas Day. I told her No... not for a few more morningtimes. "Oh, yea.. first, it gotta snow! ", she said. "Oh no... I hope not! ", I said. She is asleep in her bed after losing her pink sock monkey for a while. She got it from Gwen the other day and it has 'Esme' stitched on to it. I work with Gwen, and she and Esme love each other whenever they see each other. She was throwing the sock monkey in the air and it fell down on top of Daddy's head and knocked some things off a shelf... so she has to go away for a day or so until she can learn to be nice with her. The other night she was dancing with her all around the room, playing ballerinas. I have tomorrow off... we'll see if we can give away before-Christmas puppies... but not sure if the weather is going to cooperate. I love pumpkin seeds, even the tiny ones that I have to nearly pick apart with a tweezer... well that might be a bit much! I cooked one of my small pumpkins last night that was from August - and it was still very good. I roasted the seeds and they are tiny, but have that delectable green oily stuff in them that is the reason I keep picking at them. With the flesh, which was a little stringy, I made pumpkin chili. Cut and scrape out all the stringy stuff and seeds on the inside. Set this aside in a bowl of water for preparing another treat (look at the end). Cook the pumpkin face down in the water for about an hour, or less - if the pumpkin is very small, at 350 degrees. Cook it all together and use your senses to see if there is anything else it is 'missing' for you. roast at 350 for about ten minutes, not too long - or the insides will turn to powder inside the shells. I like this recipe, too and his science+cat graphic at the top of the page. It seems others had the same 'spinach should go with this' urge that I had... and turkey came to mind, too - but I went without it. I am another half a year older. The days will start to get longer again from here forward. Planting time is about three months away, or less... it sure doesn't feel like it. And of course, Christmas, and the season of being together with the family and giving real thanks for all that has become and will be towards the new year. I was home early and was going to have a late day today - so I broke out the sewing project. I chose another McCalls 8001 dress in navy blue with a lower waist treatment and it turned out quite well. It doesn't look half as 'Amish' as the last dress did - a bit 'avant garde' with the lower waist and the rest seems to fall perhaps 'Japanese' because of the same formal sleeves and the Japanese rabbit fabric. Esme wore it while playing Portal with Daddy on his computer (she mostly is just a back seat driver) and Daddy and I puzzled through several levels together, as well. My semi-left handedness makes the controls frustrating but Mark is able to do the 'fiddly' bits of dexterity and the problem-solving is really refreshing. I finished the dress in three hours even which is a pretty good time run for me. I need to wash it before any pictures come up since a glass of milk found it's way onto it and all of Esme's bedding minutes before bed last night. I don't have much other news at this point... working on post-Christmas gifts to send out in the mail and still have to wrap more than half of the Christmas day items. I need to get an orange and some chocolate coins for Esme's stocking... she liked that last year. Basically I feel that it just can't really be Christmas yet - working in retail will do that to you. 'Christmas' starts just after or sometimes even before Halloween there, and by the time it arrives everything seems like it has been there forever - and the day itself creeps up, usually to emerge that morning as 'oh yea - this is the real thing.... wow'. I guess that is the way it should be. //growl// My older sister keeps calling Esme 'Isabella'. She sent a Christmas card to her under that name today saying that 'she loves her even though she has never met her' (there are reasons for that) and saying she has this special present she bought for her when she was born that has her name on it and she has never been able to get it to here - she hopes she can send it etc etc.. ' *growl again* I'd really just rather not deal with all of that and send it to the round file. My mom has memory problems and was able to get 'Esme' somewhere in the first year - and my sister has it written on numerous things as well as all over Facebook to help her out... and still goes off and writes something else. She just knows how to push my buttons - from anyone else I would brush it off.... but I have my sister feeling that it is intentional to see what I am 'going to do about it.' btw: her daughter is 'McKayla'... would she like it if I sent her a letter addressed to Michelle? I finished the triangle shawl a few days ago - here is Esme modeling it for you. It is almost a perfect fit for her... not so much for me but it is very warm across the neck and shoulders. I finished a lot of cleaning downstairs. The fabric is out of the washer now, it is various shades of blue similar to this old dress she is wearing. There are two other things to repair and a new pattern came in the mail. I'm pouring up a cup of coffee and going to look at what to make out of this fabric. This morning at 5 am the puppies were howling downstairs in the basement. Esme gets up and puts on her shoes, walks past our bed and downstairs and proceeds to have the following conversation. 'I can't sleep. You go away, run away, go away scram. You be quiet. You are loud. I am so tired and I can't sleep! I do not love you, no, go - I do not love you anymore. You go sleep. You go run away. Mama and Daddy are sleeping, you be quiet! etc etc.. It went on for several minutes. The kicker? Silence. All of the puppies went away for about five minutes. That was about as much time as it took for her to come upstairs, take off her shoes and get back into her bed. And then, of course, the yelping continued. When she woke up later in the morning she came to my bed and said 'Mama, you stand up, it is morningtime, you stand up, stretch and yawn and stand up and go downstairs get me food, yea, you get me food, downstairs! You get up stretch and yawn like this, see?' And then I remind her we need to get ready to go to town with Grandma today. She told me we had to bring Grandma a Monkey Esme, Grandma needed a Monkey Esme that could talk. Uh huh. Then she started 'checking' to see if I was ready (which obviously I was not) - and tells me the thing she sees missing are socks. Hey, wait, I need socks. I get socks. (she got her own socks and shoes and put them on). Mama needed a lot more than socks - like non-pajama pants! We went to town and took a few hours buying groceries and other necessities. We just got back, and I have the fabric washing for another new dress. There are a lot of things I want to do - and lots of cleaning that needs to be done. I hope to have pictures of finished projects maybe later today or tomorrow? It has been hard with the mid-day schedules I've been getting to take any pictures... After today off I will have five more days 'on' of varying schedules again, right up until a few days before Christmas. I ordered more beans from the Little Ragamuffin (See sidebar links) - King of the Early Bean and Hutterite soup beans. Both look very interesting. I had to fight Esme to wash her hair again last night - but it wasn't quite as hard as it usually is. After the initial water dousing I was able to convince her to pour half of the water over her own head, and have her sit still to get most of the rest poured over her. I told her she had to be a 'strong' girl and do this herself, brave and strong. She said she was 'big and strong' - but when faced with the fact that I can do that without crying and she can't - she was willing to try and be 'brave and strong and big'. We're making some improvements... I am so glad she is reasonable, at times. //dressing note: She was able to do most of her own sweater buttons today and undo them without trouble. I did have to help her with her 'frustration' problem to slow down and try again on the buttons - and to try the third one again while holding the hole open instead of just shoving at the button. etc etc.. She is really coming along, now, at least with the huge buttons that are on that sweater. The only thing she has to have us help with is putting on or taking off is her dress with the back zipper. Front button dresses will probably be something on my agenda in a few more years - but for ease of making, taking care of etc... the back zipper and back-ties are still a better choice. This morning as soon as she woke up she ran to the stairs to go downstairs and use the potty - then ran back, got her shoes saying 'no no no need shoes, there we are', put them on and then ran downstairs. I liked the self-correction! She told Daddy he was 'big' the other day when he was helping me clean some... mostly because I tell her she is too little to really help so Daddy is helping, he must be big! haha! There is a lot of funny lately, can't remember quite all of it, she tells me her hands are crocodiles in the bathtub and one is an Esme crocodile and the other is 'best friend', and the mama and daddy crocodiles are my hands, they have to come save the others and give them soup. I don't think she understands the concept of 'sister' or 'brother' well at all.... although I try to explain it in movies as 'that is his brother, his mama and daddy's other little boy..' etc. The saddest thing she has said lately, about a week ago I think really - is that she thinks her Grandma and Grandpa were eaten by a whale and she has to find the message so she go can find and rescue them. She has such a vivid imagination and captures ideas from everywhere, that one from Pinocchio, of course. Before Mama and Daddy got sick with the ick she saw Mark's parents every few days or at least once a week. Now, it is much less because we were trying to make sure Grandma didn't get the ick. We've been to see Grandma several times since then but Esme still asks me sometimes about the hospital and if we are going to see Grandpa today or tomorrow. In the bathtub the other night I asked her what she wanted to do when she got to be a big girl like Mama.. and she said she had to fix people. I asked her if she was going to be a doctor, and she said no - and then thought for a second, and said YESS... yes little Mama, doctor go fix people like Grandpa! at the hop-spital, I be big, I be doctor and fix Grandpa! Let's go!' I told her it would be a long time until she got big - she had to grow, and sleep and grow more, until she was as tall as Mama and Daddy. She has been telling me every day that she is a big strong girl, and making a muscle with her arms, and telling me she is getting BIG little but BIG! Another thing she is saying often is 'power went off' on anything that isn't working properly - electronic, on tv, or sometimes rarely even with things that are not electronic at all but are not doing what she expects. Also, hearing her explain step by step what is going on in a show she has seen often - like Bambi, is very funny. //note// Sometimes, like when reading the above ramble... I think I'm adopting parts of Esme speech myself. *facepalm* well, give and take alike, I guess! I can tell it is winter, or approaching quickly, as things are flying on the needles here. I want warm things, socks and shawls and afghans. And I want to clean - and to have lots of cleaning cloths. So, now with the 'ick' bronchitis/pneumonia mostly gone my knitting needles are clacking. I've used so many of the kitchen cloths for cleaning lately that I feel I owe Mark more to use only in the kitchen and have worked up a few of those recently in a pattern he requested. The new texture should make them easier to tell apart from cleaning cloths than the others... try to keep them separated mostly by colors but it doesn't always work. octagonal swirl cloth <--would like to make several of these, and the shape would be different on those as well. Mark requested I alter my usual 'Grandmother's Favorite' dishcloth pattern this way so he can feel the edge before his finger slips through an eyelet hole. He uses them mostly to take hot things out of the oven and to grip hot lids on pans. He has a problem sometimes with the eyelet being a right where he doesn't expect it and his finger slips through onto the hot surface. I could also try to make some dishcloths that simply do not have the eyelet - it is possible. I am working on Esme's sweater - getting closer to the end of the back panel. Then I will start taking it to work and making the front panels. I have finished my garter stitch triangle shawl and am wearing it. Esme calls it the 'pink stripe wearing you wear'.. if she can't remember the word 'shawl'. *ha* She knows it is not a blanket, and gets stuck on what it 'is'... she tried to wear it to sit in our bed last night and decided if it wouldn't allow her to stay up later then she would give it to back to me. It looks nice and is warm, but not as warm as a stockinette stitch would have been. I will try to get a picture of it in the next week or so, as well. The crocheted rug has been put aside for a little while as it is not a necessary at all. Now if only I can keep my feet warm at work! It is hard to get something knitted that fits within your shoes... so I will have to buy some warmer socks and have my knitted woolly things only at home. That won't keep me from knitting more, though! My week is up... back to normal tomorrow with an early morning shift. We plan on going to Grandma's house today and helping her with a few computer things. Esme is pretending to be a butterfly doctor, and blowing bubbles all over the kitchen etc etc... I have been working on a few more yarn projects. This will be a slightly larger sweater for this year, using the one from last year as a pattern. I am also making a circle rug out of scrap yarn, crocheting it in the round. It is coming along quicker than my knit afghan is... but it will get slower and slower as it grows and probably 'catch up'. She is also holding one of her dinosaur toys and singing 'there is a new tooth on the way' to the toy. This morning I had to laugh because she had taken towels and covered up the puppies downstairs because they were cold. They did seem to appreciate it. I have another round of cleaning to do down there with the mop and scrub brush before we go see Grandma. I'm actually feeling well now.. and it is warmer downstairs right now with the sun coming in. It is nice. to think on...as we face the 'global economy'... is there a domestic economy anymore? Is there, in the majority of United States households, such a thing as domestic economy anymore? How much of anything truly necessary for the running of the household is made by members of the household? Would they, if pressed, know how to make any of the products or raw materials of those items from the world around them? From the most simple idea of crafts in making something practical for the house - like a quilt or a scarf etc... to the more complex ideas of raising food, keeping chickens. There were many productive farm activities that were once necessary functions of the household like making soap, vinegar, storing, grinding and using grains and other materials.... If money had no value, what could a family make that WAS of value? Could they make enough to trade for the things they truly needed to live in health and relative comfort? There was a time when towns did not form around an area unless there were adequate resources, water, salt, wood, lime - something brought them there and kept them there because it was an important place with important resources. Now, cities pop up and grow and thrive on other factors, but if supply chains were not as easily procured of necessary items - the town would become a shell, unable to support such population. Other places would thrive as much as they have before, if the people remembered what brought settlement there in the first place. Not that I am saying we need to go back to the time of the Old West, or even pre-colonization. But, it would be nice to know some of these things - to have them in our mental reference and to pass them on to the children as real and useful activities to learn. If such things are lost, and the entire 'developed' world becomes about how much currency one has to buy the things of life... can we, would we, lose the knowledge even about what our basic needs for a civilization are? Can we truly call that developed? These are things that have been rattling in my brain - nixtamalziation of dent corn which makes hominy. This is easier to grind without modern equipment and also (surprisingly) breaks out the niacin from the inside of the structure which allows it to be digested. Without niacin, the corn is missing a major component of what it takes to keep a human being healthy. Other grains and what they provide, what they cannot, the history behind each of them... Beans also need to be mixed in the diet alongside the corn to create complete amino acid proteins, but some (particularily kidney beans) can be toxic if not soaked AND boiled the appropriate time periods to leach out the toxins naturally present in the dried form. Squash provides the vitamin A and vitamin C to keep populations healthy through the winter. 'Three sisters' planting where these three plants grow together taking up different tiers of the same growing space, each using different materials in the ground. Turnips and rutabagas and other root crops also providing vitamin C and folate for months in storage - looking ugly and awful on the outside and providing a sweet rich flesh on the inside, that once cooked, can provide much needed nutrients in the dead of winter. And not just dietary, but there are other "natural chemistry" activities people did for thousands of years - leaching salt out of the groundwater and marshes in various ways far from any ocean source, leaching tannins out of wood and acorns to create turpentines, laquers, leather tanning and more. Using wood ashes to make soap and also to make the hominy corn... Making various vinegars out of apples and other items, for cleaning, preserving and also numerous other chemicals, waxes, oils, fibers... that used to be part of a working farm economy. And all of these thoughts from growing and holding some beans and corn.... wondering - civilizations rose and fell around these essential things. What is 'essential' is rarely simple, but always necessary. For the reader: What do you make? Do you know how to obtain essential nutrients, chemicals and materials without a checkbook or a credit card? Not everyone will know how to do every thing or process... but we must retain what we can of the knowledge. Some day, it may be necessary again. And, thoughts on pressing oil, collecting plant waxes, grinding corn... it is all very interesting to me. I think I have a bit of a natural chemist breaking out, growing right alongside the botanist. Things are slowly plugging along, vacation ends on Sunday. It is a little warmer outside, in the 40s and the sun is shining. Both of those are nice. If we could get rid of the tiny lingering cough we have left (Mark's is worse than mine)... we would be good. Esme really wants Mama to get back to wanting to play, or 'be busy' all over the house. Every five minutes she wants us to 'be busy.' She knows her Mama... She gave a good rendition of 'how to make a dress' to Grandma yesterday, which included squiggling a finger on 'fabric', picking up pieces and tossing them to the side, then running the fabric along a surface while giving an impression of a jackhammer, then the dress is 'done' and can be held up under your chin. That was cute. homeschool? : Not sure if this counts, but she has been interested in certain things. All of her balls, marbles and playdoughs have become 'Earths' and they go flying around in the air. So, I am trying to tell her more about Earth, Sun and Moon, as well - as she has taken an interest in 'earths' and 'planets'. I've had some success in showing her the 'setup' of the three and what they do, and what they 'are'... but it will have to develop over time. I showed her a picture of the Earth as seen from the Moon - and told her the Moon was tiny so the Earth looked BIG from there. She thought the idea of people standing on the earth with a camera was amazing. I described that the Earth had water, land and clouds - blue, green and white.. but the moon only had white and grey sand and no plants or animals. She says it is 'our moon' and 'like my Earth and like my Sun.' I also told her that if the sun was not on part of the Earth and people made lights like in a city (like LOTS, thousands, of little flashlights all on and pointed up at the sky) and we took a picture from the moon we would see all those little lights here and there where the green land was. She really thought that was cool - and said 'Mama, I love you.' and squeezed into my arm and thought hard about that one. I've been looking at solar system books and kits but have not found anything appropriate for her dexterity and level of roughness that still had some scientific accuracy to it. I did some cleaning, need to do more. I want to play with my seed collection but I don't want to be in the cold downstairs more than I have to be. Need to see to the laundry as well again. Esme is wearing her 'green size 5' dress and matching pants, today and it is a good working outfit for her. She has been painting a lot making 'heads and bodies and arms and legs' people and fishies. She spilled her paint cup once on the floor and went to go hide in the corner... but we cleaned it up and I know most kids her age would have spilled it ten times over now in the past week. We do need to get her more watercolors for Christmas. She has went through both of the pans we bought her for her birthday in the course of a little over a month. I think I have vetoed markers as she will not keep their caps on and I've thrown away another box she hid in the pool table without their caps on. The puppies had learned to climb the stairs and we want to 'contain' their mess to the basement, plus they are LOUD and keep us awake otherwise. Mark had put a board in front of bottom of the stairwell to keep them contained to the epoxied floor down there, which is much more scrubbable than the stairs or upstairs floor. Esme went down there this morning before I got up and moved her chairstool to the edge of the board so she could step from the steps to the chairstool and down and up without having to climb the board or ask for help. She did that by herself, carrying the stool from the kitchen and leaving it there until we removed the board in the morning. I was pretty impressed by her forethought there - after climbing the board once and knowing she needed a better solution! The other night I asked her to go to bed and she growled at me and stomped her feet. Usually, all I have to do is tell her what we are doing tomorrow and that we need to sleep until the sun comes back. She wasn't having any of that, because she was 'being busies downstairs' and didn't want to go to bed. I told her she had to stop that if she wanted to be a 'good girl' and have the privileges good girls have, (crafts, read books to her, go to town, go to Grandmas, even Christmas presents). It wasn't a long conversation, and I didn't think it sunk in. But, she went to bed after three books. The next night she went to bed easily and after we read one book she hugged her rabbit and gave me 'hug and kiss' and blow kiss after me as I walked away. Then she called after me 'see Mama, I no growl, I'm a good girl. I stopped that.' Well, at least it is sinking in, somehow... Her memory is astounding, although she only shows it once in a while now. I also need to do more quilting on the queen size quilt, so I can wash it properly. I am loathe to not have it's warmth on the bed but Mark is right that the dust it had collected in two years might be prolonging our cough problems. He bought an electric blanket the other day for part of his birthday (yesterday, he said it was a great one and he bought donuts and meat on his trip out) so the warmth isn't as important as it had been. development note: She can put on her socks now, as well as her shoes (got that one early but had trouble coordinating putting the foot into the sock while pulling with hands). She can use scissors to cut some things, but still cannot cut out a shape.... mostly this is my fault because I don't give her the opportunity often. She is wanting to spend more time 'doing her own thing' as well... Mark and I discussed tonight transforming the 'school room' into more of a kid play room for her. If only it wasn't so cold there.. maybe a rug would help. We had a short spurt of snow this morning. Esme got to hold a small chunk of it, but then I whisked her off to the bathtub. After the bath I put the same dress back on her - as it is the warmest at the moment, and I haven't gotten good pictures yet. 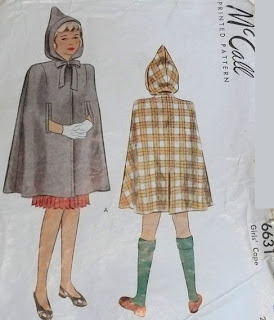 This is the altered McCalls 8001 in size 5 (circa 1961) Alterations: Two front pleats instead of one central one, and the coat sleeve superimposed over the cap sleeve in the pattern to make a long sleeve. It has my own 'make-do' of putting two small pleats in the back upper sleeve instead of setting it in properly... I always do that, because I hate fussing with sleeves and that takes the fuss out. It really does fit her very well, even with a 'short' zipper in the back. There is no fussing with the 'other arm' in this dress style, because the back is open wide and there is not the tight quarters of some of the previous patterns in the waist area. The wide waist is drawn up to her back with ties placed two inches underneath each armpit (this is in the pattern, too). I made her get her hair washed. This is still no small feat. She is STRONG and it is hard to get her to stay in one place when she does not want to. I did manage, and after her hair was dry she brought me four hair ties and said she wanted 'bossy lamb hair'. I didn't quite get the description... but she did mean she wanted braids. I've heard some other odd langauge from her as well - the other day we were playing air hockey on the floor and I missed a puck, which went far behind me. She said something on the order of 'you missed it, don't worry home-boy, just try again Come on, don't be scared now.' What in the world? (have been hearing that one a lot, too actually) - for a kid that doesn't watch broadcast TV and doesn't go to daycare or preschool... she comes up with some doozies. She has taken a recent bout of bringing a chair and a footstool up to the puppies and saying she is 'Grandpa Esme' and sitting there pretending it is a rocking chair while the pups vie to be picked up individually. Daddy says if she ever accomplishes that one - being a Grandpa - he WILL be impressed. She takes her little flashlight and shines it into her piggy bank (Daddy says: future veterinarian?) and also into her tanker truck she picked at Tractor Supply yesterday. She told me she needs to put water in it - because it is a water tanker truck. She has been saying she wants animals, so we took her there to look at the Schleich figures she has been adoring on in the past. I set her free in front of them saying she had ten dollars to spend and could pick out one big one or two little ones etc... She picked up a spotted horse for an instant.. but it was a big one. She then made a beeline to the diecast ERTL trucks and picked out the water tanker and a school bus. She was set, those were what she wanted. It was just over ten, so she did get to take those home. After she was embraced of new toys, and full of fried chicken, she came home in a pluckier and more active mood than either Mom or Dad were ready for. She ran us into the ground for the rest of the night begging for us to play with her, read books, paint pictures etc etc.... We are both almost out of the sickness that had kept us down the past week or two, but not entirely. I have not been wanting to go to our 'school room' because of the temperature down there - it is very cold. She won't stay out of there. Mark and I were watching a movie lsat night and she was down there and back up for the better part of an hour - doing nothing more than staring at the materials. I brought anything she asked for upstairs and she played with it for a few minutes, and then was back in her chair in the school room pretending. Novelty? Independence? Reminiscing back to crafts and things we did in there when it was warmer? I'm not sure. Making some more progress on this. My circular needle came in the mail but it was not what I had expected. There was some mixup and I received a much smaller size. So, knitting this long straight needles. It will probably be about 20 inches 'tall' when I am finished and much wider. I also received the Baker's Creek and Seed Saver's catalogs in the mail.... very tempting! Odd Preschooler thing of the Day: She told me today at 3:00 that her animals were coming in the truck, up there, in the truck in fifteen minutes, have to wait for it, go get them. I'm a little weirded by that - as I think that is what arrived at Grandma's house instead of ours (because it won't fit in our mailbox), and she only saw them by accident on Ebay when I was watching the auction. I told her I would 'consult with Santa' on sending them. I did win the auction later that day, but took an extra day to pay for them... how would she know when they were being delivered? Simple answer: She heard the mailman, and things Mama asks for on the computer come in the mail? So, if she heard a mailman it must be her toy coming...? ok -- it didn't actually come in the mail, but it could have, and I'm still impressed at her memory skills! Inspired by Elizabeth Zimmerman's 'A Knitter's Almanac', a book of simple projects signifying the most needed items in a household over the course of a year... Simplest triangle shawl ever is based on a knit garter-stitch dishcloth. Start with four stitches, k2, yo, knit to end. Repeat this always doing the same sequence, k2, yo, knit to end and the item will grow and grow. Once the shawl is a proper size, make some sort of edging or eyelet at the top for a few rows and bind off loosely. I am thinking to do a checkerboard pattern for three rows, then garter stitch for another three and binding off. Then I will fringe mine all the way around if I have enough yarn. I am knitting it on size 6 needles right now, and waiting for my circular needle to come in the mail to transfer it over and continue making it wider. Esme got watercolor paint all over the front of the new dress last night - but it did wash out. When I took this picture I thought about these sleeves... that is usually where a dress 'shrinks'... but this one doesn't look too much different than when I made it... how can that be? The acrylic garter stitch blanket is being knit on as well, it is about 3/4 done and getting longer and longer. I usually put just a few rows on that at a time, as it is about 4 feet wide and heading towards 6 feet long. Today is my first day of December vacation... the last vacation of the year. It will last about a week. It comes at a bad time for a few people at work - but we had to scrabble and schedule whatever time was left somewhere in late October.. and things that happened since then have made this a bad time. *sigh* I did need it, though! Hopefully they will all hold it together until I get back next Monday. My sick is not entirely gone, Mark is still coughing - but Esme seems good. We hope not to have to do a lot this week and just heal up. I went to the store last night and used Nana in Minnesota's Christmas gift card to buy a few things for Esme, a blanket and stuffed animal and two games, all to put away for Christmas. Not out of the gift card, I bought a yard of cotton fabric and yarn to continue projects today. 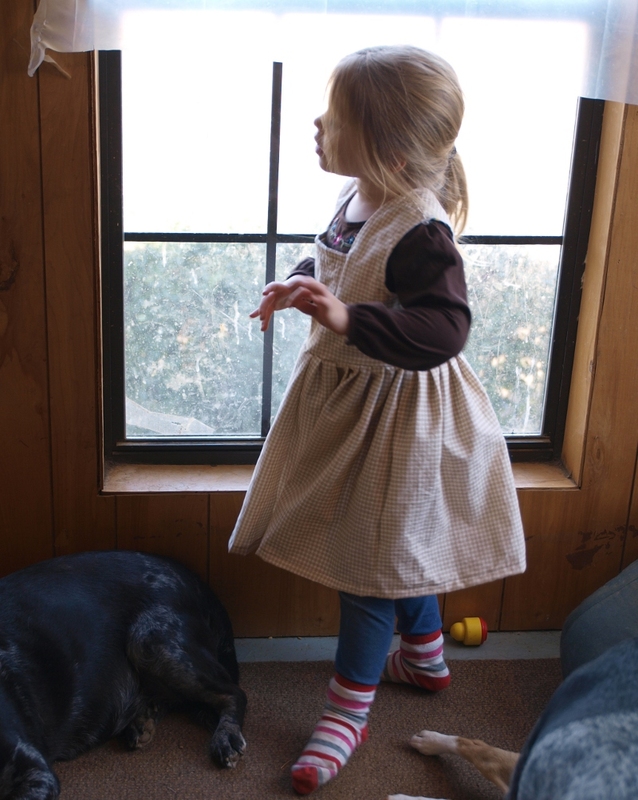 I plan to make a new 'Cinderella' type dress for Esme with longer sleeves out of the new fabric. I have some little projects I am preparing to send out in the mail, and a doll to drop off at work sometime this week for the auction for a coworker's mother's medical bill. And I have the bean seeds to learn more about. So, I have some things planned but nothing very intense. got myself right onto this and now it needs sleeves, zipper and hem. That will take a few more hours but it should be done tonight if I keep on it. I went a little crooked on the neck facing tacking (ziggy stitching there) but it wasn't enough to redo it. For the sleeves I took the short cap sleeve that comes with the pattern and combined its shape with the coat sleeve in the pattern! Adjusting for the length of her arm the sleeves ended up very useable.... maybe not perfect but pretty close to it. I had that weird dream again last night -- the one where people come to me and tell me they did not have any food... We were searching for people after a disaster and trying to gather survivors and supplies. A skeleton fog said it had warned me of the 'oncoming famine' before...why had I not done anything about it... and it disintegrated. That nearly woke me up, as yes, I have had these dreams before. That was a 'brain pay attention and think as if awake' sign from my subconscious. Famine dreams are supposed to be very bad omens, sickness and business problems to come, if the famine is happening to you and you have helplessness over no food. But, in the dreams, it is always a survival situation where I have to help everyone, where I go find the food...make the food, scour the forests and the dead gardens and cupboards. In the dream I dug in a pantry and brought out an apple, and a potato, a can of soup and some beans and began to gather pots and equipment to make a soup. A big guy from work arrived and looked at the food in one of the pots. He was hungry but he commented to someone else who had gone to get me that he didn't want to eat that, wasn't there anything else? That was what there was - I could add some more water and another potato and make enough that everyone could have some. In other recent dreams I am trying to collect seeds out in a dead garden and everyone else is just worried.. I am planning with the materials at hand while those things are still there. I was sorting through metal and useable parts, hinges and screws and nails in a ruined antique shop that had price tags on everything including the registers... all old as if someone had a last dash to make a profit and still had to abandon the place. It was as if I was looking through time at people arguing about if they were allowed to sell a piece of paper at one shop while there stacks and stacks piled in another corner that no one had remembered... weird games my brain plays... I wish I could write them all down and make sense of them, maybe a good book. Amazement at bean varieties... thanks to GF!